Hole in the Page - The Website of Carl Barker » Blog Archive » …but is it Art? 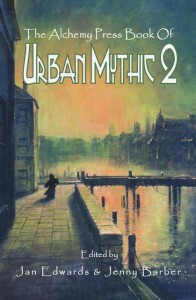 My latest published story is The West Dulwich Horror – a nightmarish fusion of classical masters, living street graffiti and ancient unnamable horrors arisen from the murky depths of machiavellian publishing – which you can now get hold of as part of The Alchemy Press Book of Urban Mythic 2 (available from all the usual online retailers). Launched at this year’s FantasyCon, along with several other great releases from Alchemy Press, the anthology contains twelve tales of myth, magic and legendary creatures, all set in the modern age. It’s another great release from an independent press clearly on the way up, given that Alchemy Press also took home The British Fantasy Award for Best Small Press at the end of the weekend, and I’m thrilled to be a part of it. For details of where to get hold of the anthology, check out the updated Publications tab above.